We suggest you arrive in Petersburg the day before your Alaska cruise. For more detailed information on getting to Petersburg please check our Petersburg page. The Sikumi departs Petersburg around noon on the first day of your cruise. We would suggest arriving in Petersburg the day before your departure and lodging overnight there. We return to Petersburg late morning on the final day of your cruise so that departing passengers can make the 12:10pm flight north out of Petersburg if they wish. (The flight south is later in the day) . There are many small private charter flight services in Alaska. If you have special needs, please let us know and we will connect you with the right charter. The Alaska Marine Highway System (0800-642-0066, www.dot.state.ak.us/amhs) serves Petersburg with several ferries. The main departure points heading north to Petersburg are Bellingham, WA and Prince Rupert, BC, Canada, which connects with the British Columbia Ferry System. From the north, the ferry system is accessible from the Alcan Highway at Skagway (via Whitehorse, Yukon Territory) or at Haines (via Haines Junction, Yukon Territory). For those driving south from the Yukon and Interior Alaska, the ferry system is accessible from the Alcan Highway through the Haines and Skagway Alaska terminals. For those traveling west on the Trans-Canada Yellowhead Highway 16 through Western Canada, the Alaska Marine Highway is accessible from Prince Rupert, BC, Canada. Canada VIA Rail Passage, join with the Alaska Marine Highway system in Prince Rupert also. You may have to wait a few days for the next ferry. Take time to check the schedules. For those traveling through the Pacific Northwest and California, the southern terminus of the Alaska Marine Highway is in Bellingham, Washington. Bellingham is 70 miles south of Vancouver, BC, Canada. Amtrak, Greyhound Bus and the Interstate Highway system all lead to the Alaska ferry terminal in Bellingham. 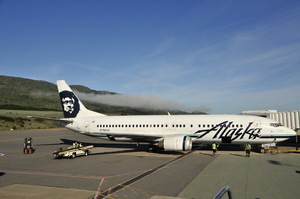 All of our trips begin and end in Petersburg, Alaska. The Sikumi is often moored at the crane dock. This can change, so feel free to call ahead for specifics, or just ask your taxi driver. Petersburg is a small town many of the taxi drivers are familiar with the Sikumi and where we are. With enough notice, we can try to have one of the crew meet you at your hotel or we can arrange for a taxi to meet you at the airport.